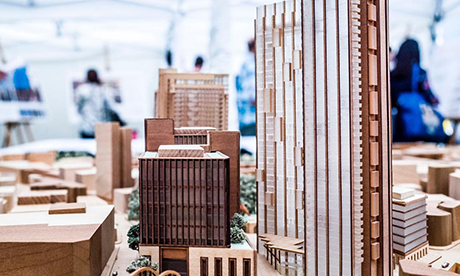 Design proposals for the Bishopsgate Goodsyard redevelopment. 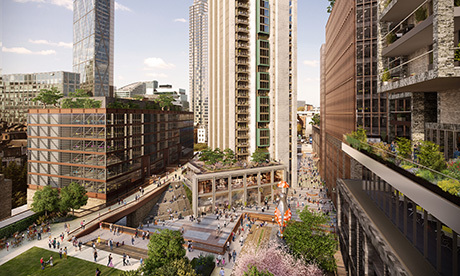 Revised plans for the £800m development of the Bishopsgate Goodsyard site in Shoreditch have been slammed by campaigners as “disappointing”. Joint developer Hammerson and Ballymore propose turning the 10.3 acre site which includes the historic Braithwaite Viaduct and has lain empty for 50 years into flats, offices, retail and a public park. The developer is now submitting amended proposals for a “tech-focused” quarter with a reduction in tower heights but More Light More Power, a campaign group formed in opposition to the development, argue the changes are merely cosmetic. A petition has been launched calling on the local authorities of Hackney and Tower Hamlets to throw out the application. In the new plans, four of the towers have been cut by the equivalent of six storeys – to 26, 30 and 38 storeys and the tallest 48 storey tower has been trimmed by the equivalent of one storey. Many of the one bedroom flats in the original plans have been enlarged to two bedroom units, meaning a reduction of the overall homes proposed for the site from 1,464 to 1,356. The development will still contain 10 per cent affordable homes. The amount of glass used has been reduced and replaced with brick to mimic the surrounding Shoreditch buildings. Hackney Council has already said it opposes the development, with Mayor Jules Pipe calling the initial proposals ‘out of scale’. 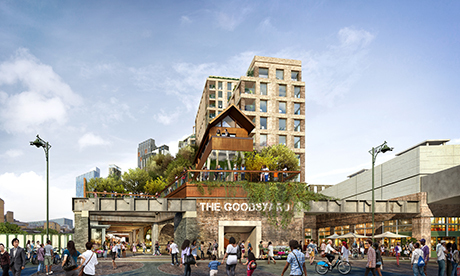 A spokesperson for Hammerson and Ballymore said: “Our plans for The Goodsyard will open up a fantastic space in the heart of one of London’s most interesting areas.